On December 8, 2014, terrorist leader, pig farmer and a disgraced former MP Oleg Tsarov gleefully reported that Netrebko “accepted the flag of Novorossiya.” The nonexistent republic the terrorists strive to carve out of the Ukrainian land is the proverbial meat grinder, where “rebels” armed by Russia fight without a cause. Russian Foreign Minister Sergei Lavrov described the beleaguered region as a festering sore, but disingenuously blamed the West for the continued bloodshed. 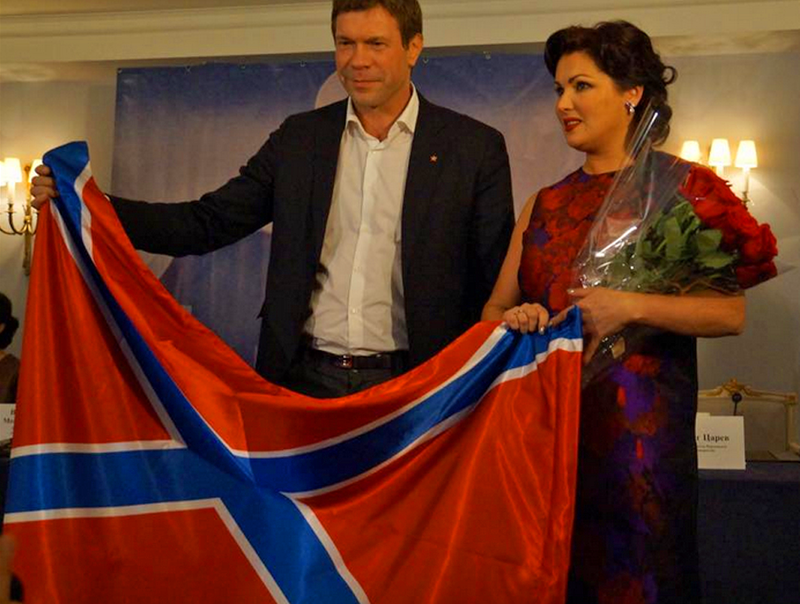 Anna Netrebko supports the terrorist groups in Ukraine not only by holding up their flag, but also by donating 1 million roubles to the Donetsk Opera Theatre. After hobnobbing with Oleg Tsarov, Netrebko handed him the check. On his Facebook page, Tsarov wrote: “The funds Anna allocated for the restoration of the theater will be available for “Donbass Opera” in the near future. In appreciation of my fellow citizens, I gave Anna the flag of Novorossia.” Tsarov is wanted by the Ukrainian government on charges of separatism. He is also on the list of individuals sanctioned by the EU for their role in events in Eastern Ukraine. Theatre performances may be the last thing on the mind of local residents, as they line up to receive free porridge out of food trucks in terrorist-ridden Donbass. Much of the civilian population, including many of the opera’s singers and orchestra players, fled the area. Russia-sponsored fighting, which involves covertly-deployed members of the Russian military, has claimed the lives of more than 4,000 people to date. Netrebko’s brazen endorsement of terrorist elements in Ukraine is sure to strike a sour note heard around the world. Anna Netrebko’s misleading posting on her website continues to claim that she will become “the new face of Austrian Airlines.” Behind-the-scenes video of Netrebko’s Austrian Airlines advertisement was removed from YouTube.